This lodge is situated at the lowest altitude, although still about 2400 meters above sea level, hidden into the edge of the forest, the fauna is slightly different at this altitude with more huge African olive trees within the forest. The trek commences on the all weather road near Ankober, dropping over the escarpment leading to the easier route of all the lodges. Once at the base a unique and beautiful trek through farm land, and small homesteads this path will take you to the new lodges. 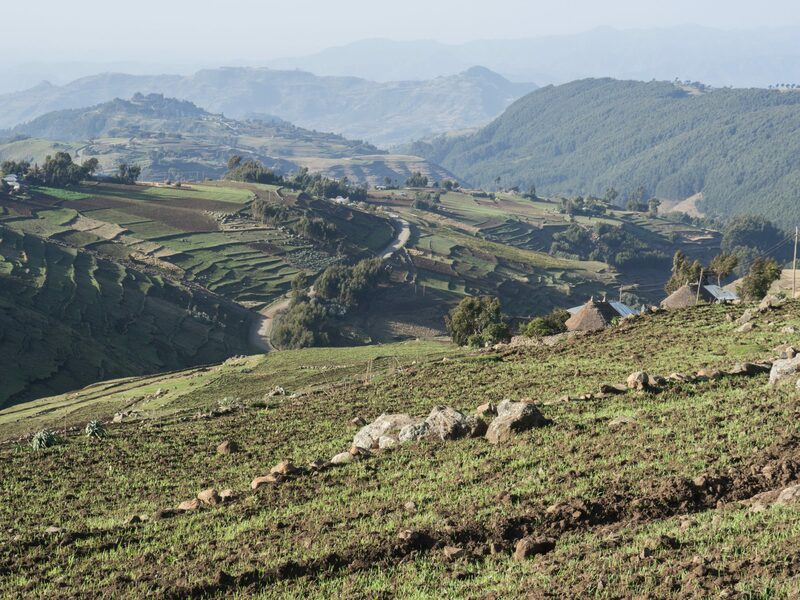 You will witness and experience what it might be like to live in the Ethiopian highlands. There is a plethora of wild life, and if you’re lucky you will see Colobus monkeys, their white tails can be seen hanging from high trees within the forest giving them away. They sit very quietly, and then something startles them and they cascade through the canopy with incredible acrobatic agility and speed. You will certainly hear the Colobus monkeys just before dawn, it’s a unique bird like cacophony, as they mark out their territory from neighbouring troops. At a lower level through the forest, there is a small community of Falasha Jews. These artisans whom make house hold pots and pans, tools and hand woven clothes. Are very interesting and its intriguing to try and understand how this group of people ever arrived in this part of Ethiopia.